Whisk yourself away to lands of magic and wonder with Enid Blyton's New Adventures of the Wishing-Chair. In Book 5, the friends visit the Land of Fairytales, but when they get there Wishler starts acting very strangely. Can they work out which fairytale character he has become, and help him be himself again, in time to go home? Short chapters and beautiful illustrations make the New Adventures of the Wishing Chair perfect bedtime reading for children aged five and upwards. A richly nostalgic offering for grandparents and parents to share with the next generation of Blyton fans. 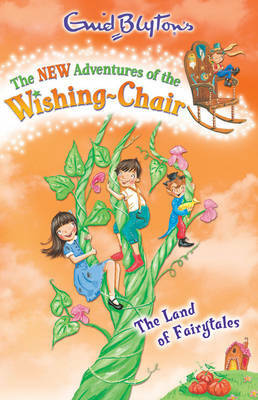 Have you collected all the New Adventures of the Wishing Chair? Enid Blyton is arguably the most famous children's author of all time, thanks to series such as The Wishing-Chair, The Faraway Tree-, The Mysteries, The Famous Five and The Secret Seven. Her fantasy stories for girls and boys have been enjoyed for generations, and with these new books, children can continue to enjoy the enchanting worlds she created.